Australia, one of the Oceania countries is located between the South Pacific Ocean and the Indian Ocean. This developed and one of the wealthiest countries of the world covers a total of 7, 741, 220 sq. km of area, making it the sixth largest countries of the world. Australian territory beside its mainland include Tasmania Island and many other smaller islands on the Pacific Ocean. Timor and Arafura Seas separate Australia from Asia and Tasman Sea separates it from New Zealand. The neighboring countries of Australia are Papua New Guinea, Indonesia and East Timor in the north, Vanuatu and Solomon Islands in the northeast and New Zealand in the south east. Australia is an island country, with no land boundary, and also occasionally called an island continent due to its size. In fact, it is sometimes referred as the smallest continent of the world. The world’s largest coral reef, the Great Barrier Reef is located in the north east side of the country. 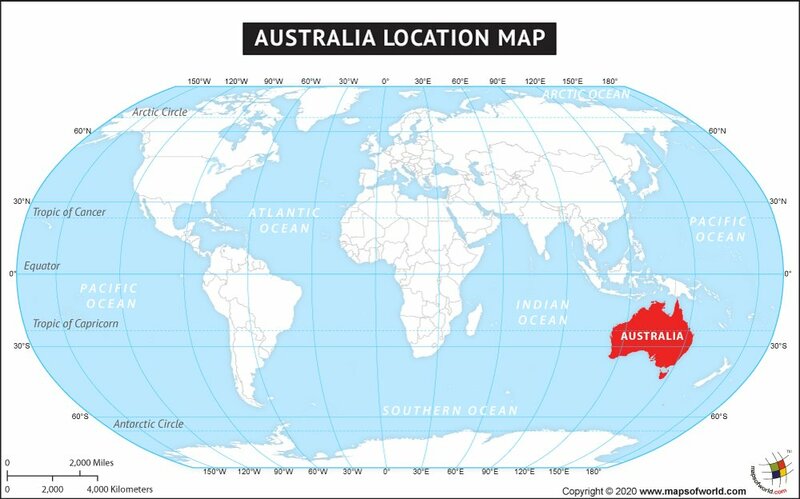 Australia is located between 27° 00' S latitude and 133° 00' E longitude. Canberra is the capital city of the country and the popular tourist destination Sydney is its largest city. The vast size of Australia is home to varied beautiful landscapes.